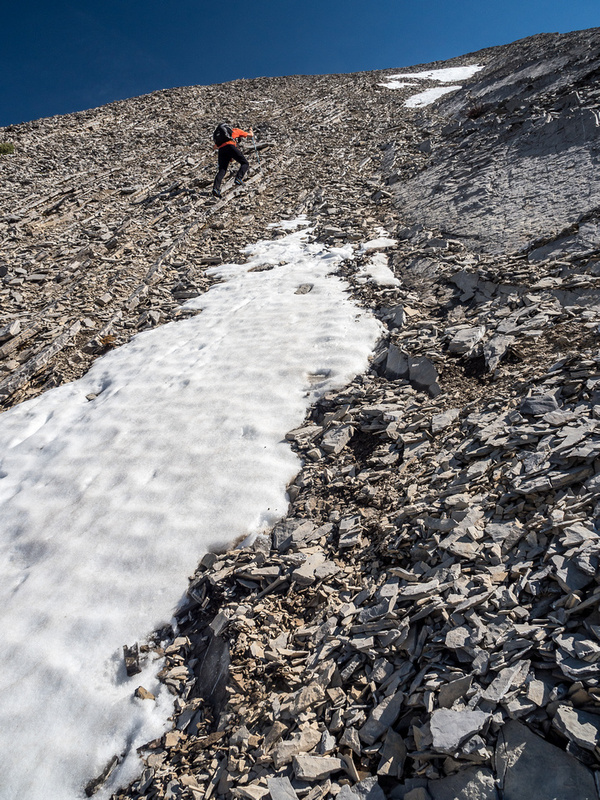 Difficulty Notes: A long day with routefinding and steep slabs to the summit which are trickier than they appear and offer some severe exposure. Wednesday, June 20 was shaping up to be a pretty nice day in the Rockies. When Phil texted me and mentioned that he was going to attempt a long-planned traverse over Mount Morrison to Owl Lake I was intrigued enough to book the day off and join him on this venture. Ever since skiing Mount Turner (Morrison’s slightly higher neighbor to the north) in April of 2017 my stoke for Mount Morrison had increased ten-fold. 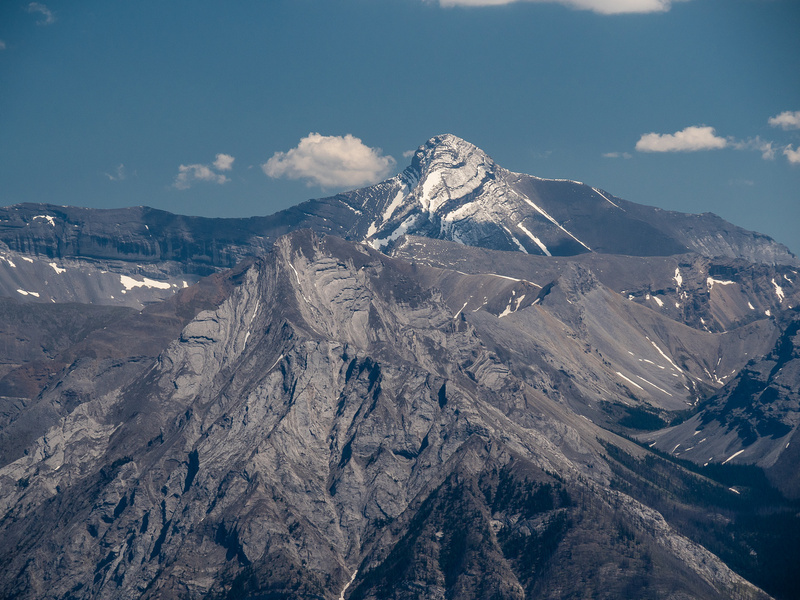 I was already aware of the mountain for quite a few years and was originally planning to tag it along with Turner from a base camp in the Owl Creek valley, possibly in Spring with a ski approach. After seeing it from Turner and now after scrambling the peak, I realize doing it with snow would be less than ideal. So Nakagawa ascended Morrison from Owl Lake in 2015, but I can’t find his report anywhere, so now I’m not even sure how I knew about his trip but I did. On return from Mount Turner I remember looking back and wondering if there was a route up the east face via a prominent gully / ridge and now I realize that this is the route Rick Collier took in July of 1998 and rated as “scrambling to 5.3” – since when is 5.3 a “scramble”? Phil had a much less technical route in mind compared to the one Rick used. I would argue it’s the more scenicroute, however. Phil’s planned route up the mountain started from the White Man Pass trail off the lovely Spray River Valley trail and followed a drainage up the south aspect of Morrison before ascending to the summit via the west face to the south ridge and from there to the summit. 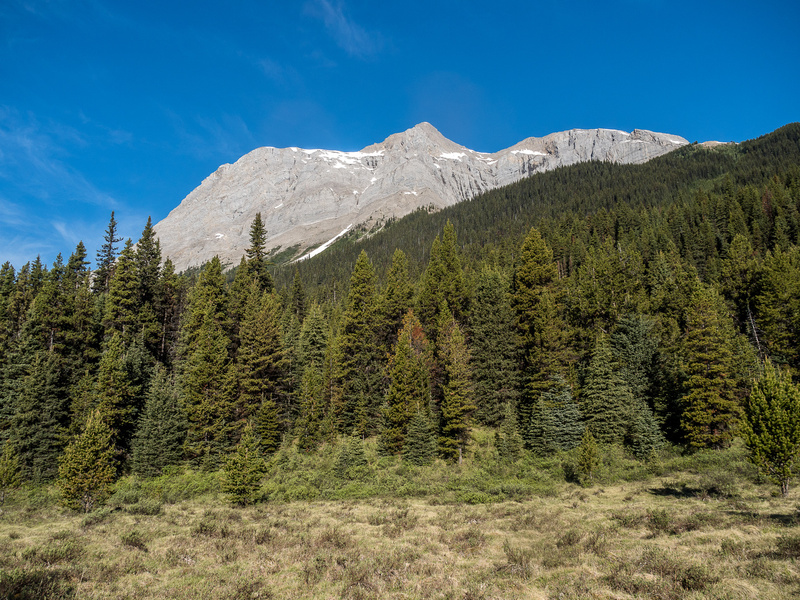 We were looking forward to the views of Mount Currie, Red Man Mountain and Mount Byng along with a series of tarns that are hidden between Byng and Morrison and are not visited very often by humans. 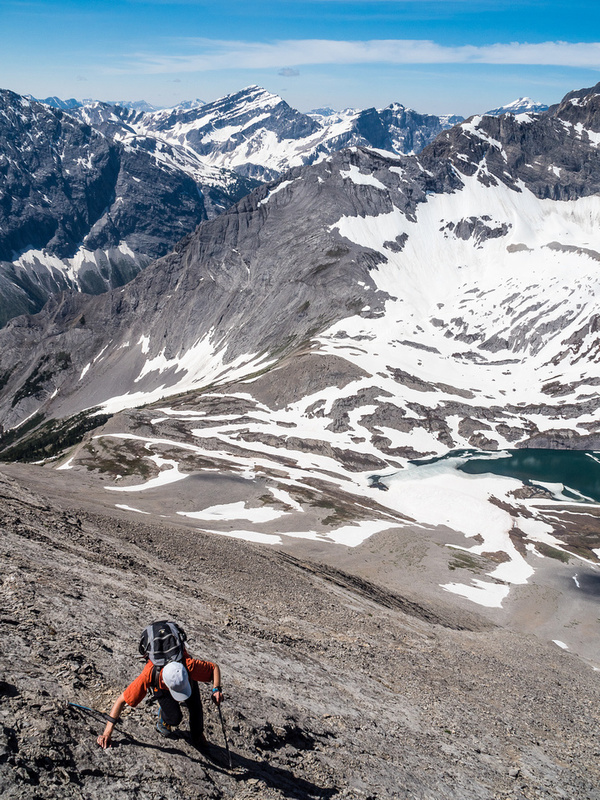 What made Phil’s route extra appealing to me was the possibility of a “twofer” – a second summit – and a high level traverse over this second summit towards Owl Lake. 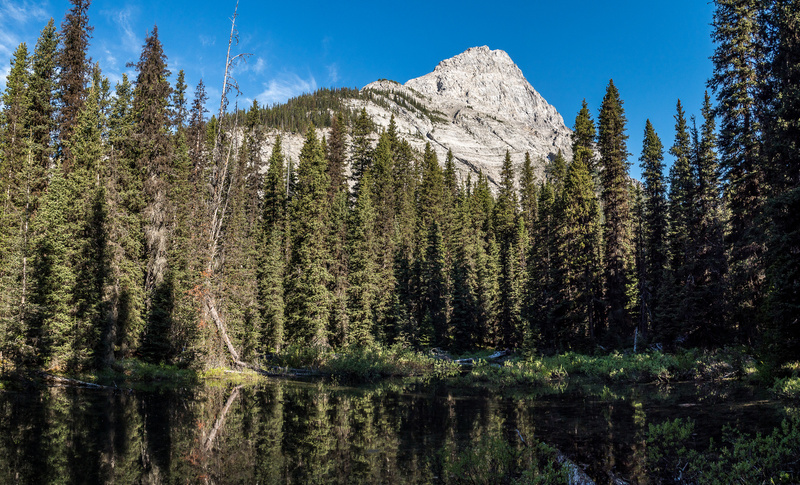 The second summit was going to be unofficially called, “Owl Peak” after its neighboring creek and lake and was prominent enough to be considered a separate peak. Interestingly, this summit completes a triangle of similar elevation summits made up of Turner, Morrison and Owl. Phil had estimated the route at around 1350m of total height gain with ~32km of distance – 10km of which would be on bikes. Obviously it was slightly underestimated, something that Phil loves to do on his various sales pitches to his innocent trip victims – I mean partners. With a suspicion of afternoon t-storms, we pushed ourselves to an early start. By around 07:00 we were biking out of the Shark parking area. Considering it was mid-week the mountains were surprisingly busy already early in the day, including some people and quite a few cars in the parking lot. We assumed most of the cars were people overnighting in Assiniboine Provincial Park. After biking out of the parking lot we didn’t see another soul all day until many hours later, while biking back. 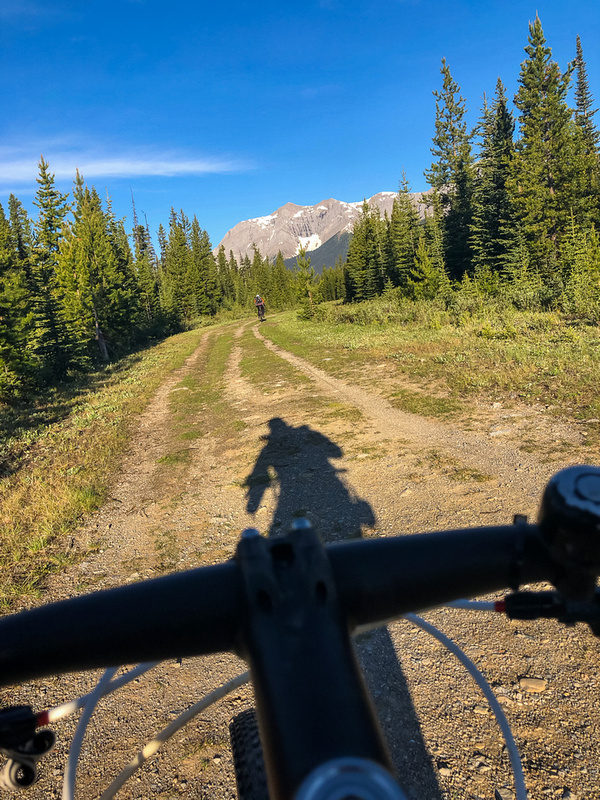 The bike ride to the Spray River Valley turnoff was quick – especially the infamous big hill that would bite us about 10.5 hours later when re-ascending at the end of a long day! We stashed our bikes and started up the lovely trail along the Spray River with warm sunshine and a chorus of cheerful birds encouraging a nice pace. I have great memories of the Spray River trail from a fall trip with my daughter in 2014, and it was as I remembered. The trail is surprisingly well maintained and very quick to travel. There always seems to be bear tracks on it too! Despite being quite close to civilization, there is a wonderful feeling of remoteness to this valley. I reminds me of much more remote places such as the White Goat Wilderness. All too soon we were already at the turn off for the White Man Pass trail. 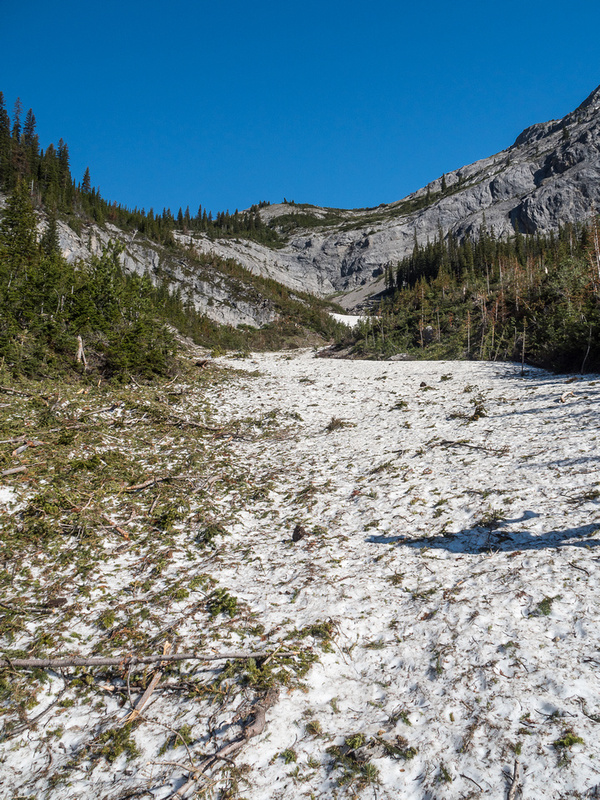 White Man Pass (2149m / 7050 ft) (also known as Cross Pass) was named by Palliser in 1858. Father Jean de Smet had crossed this pass in 1845 and may have been the “white man” the natives referred to in conversation with Captain Palliser. It could also have been the white men in James Sinclair’s Red River group of immigrants that traversed the pass earlier in 1841. Father de Smet built a “Cross of Peace” at the summit of the pass; hence the name of Cross Lake near the pass and the Cross River west of the pass. White Man Mountain, 2977m /9768 ft , is on the south side and Red Man Mountain, 2905m / 9531 ft, is on the north side of White Man Pass. We, however, would not be going to the pass, but would be turning off trail within a very short time of joining it. Actually, we didn’t turn off the trail so much as keep going straight when it started curving south along White Man Creek. Branching onto the much smaller and less traveled White Man Pass trail. 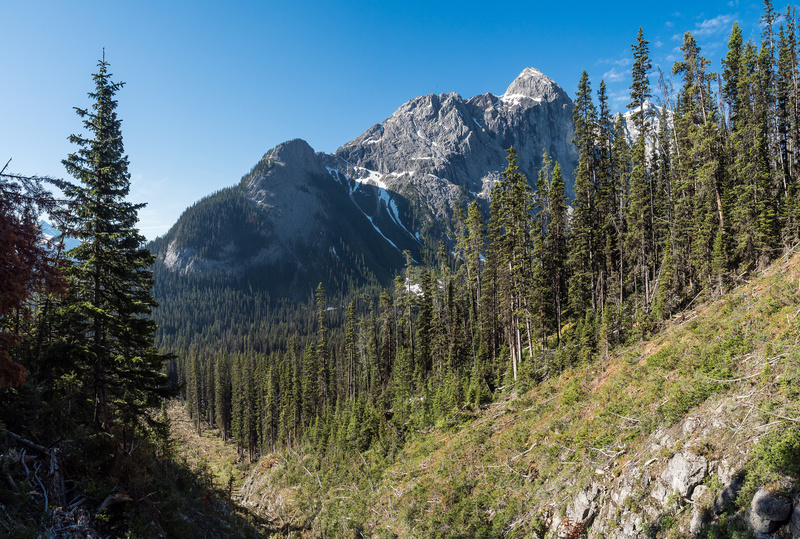 As we prepared for a bushwhack to the south drainage on Morrison, we were surprised to stumble on an old trail leading up-valley towards Mount Currie along Currie Creek! This was obviously a human trail of some sort with some very old tree cuts visible in the undergrowth along it. The trail was very rough and likely a horse trail as it crossed through several swamps rather than go around them, but it was a trail and we definitely followed it rather than take to the bush. This was a great start to the “unknown” part of our day and a good omen and mental boost. Eventually the old Currie Creek trail passed by our drainage, so we reluctantly left it and started up towards the avalanche path we knew existed from Phil’s photos (he’d taken them a week previous from Smutwood Peak). We needn’t have worried about the bushwhack as it was pretty much nonexistent. I had nightmares of our bushwhack to Warre Pond in 2014, but this was open forest with deep moss underfoot – the kind of forest that makes you want to lie down and sleep on the thick carpet of green moss. 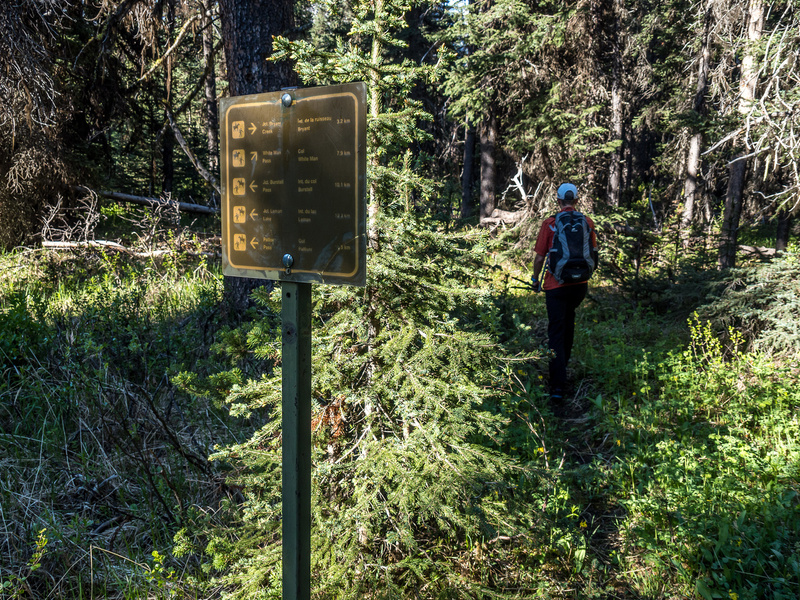 We can’t believe we’re now on yet another trail – and this one is really old. 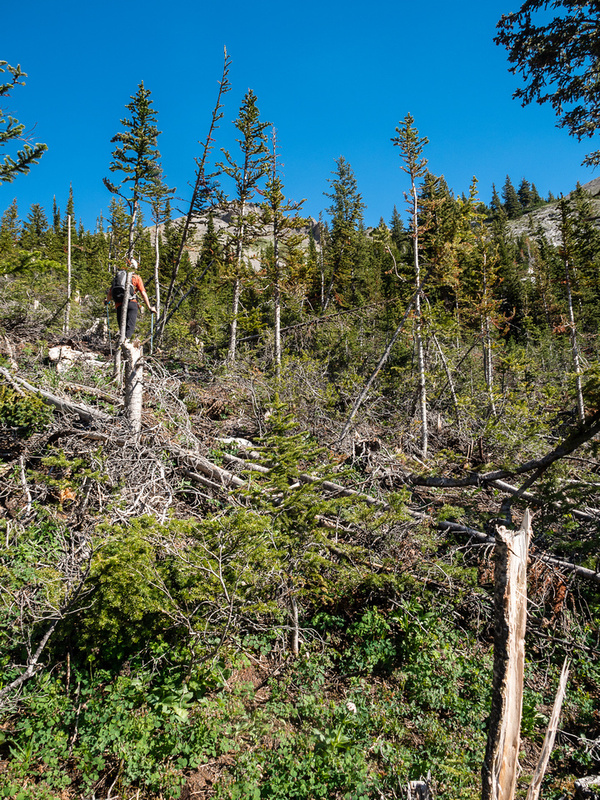 When we finally broke into the main avalanche gully, we were delighted to see that it was going to be pretty straightforward to ascend, despite the presence of freshly mown down trees of varying shapes and sizes thanks to some big avalanches earlier in the Spring. The fresh avy debris made for a delightful odor but some interesting navigation before we got into the drainage proper and even onto some firm avalanche snow which greatly assisted our upward progress. Looking south at Mount Currie and it’s outlier provided some early views and got us excited to keep grinding away at the slopes ahead. 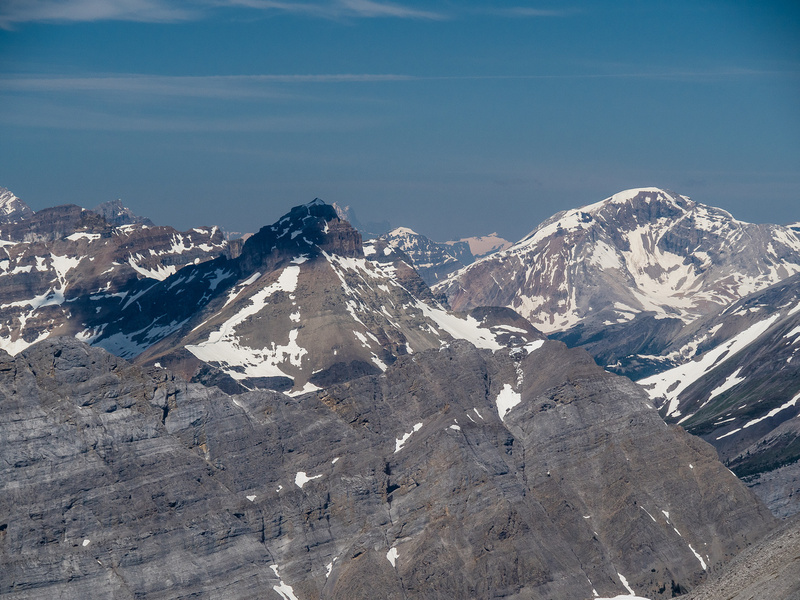 Soon we were adding Sir Douglas and even Mount Joffre to the ever growing list of visible peaks, along with other familiar summits such as Smuts, Birdwood, Smutwood and Snow Peak. As the avalanche gully curved too far west, we deviated out of the slide path and started up towards the west face which was starting to loom on our right. Despite the avalanche debris, the drainage was pretty straightforward traveling. After ascending some moderate slabs we bushwhacked a short way through a stubborn stand of trees before finally breaking into the alpine below the west face of Morrison. Running water was scarcer then we’d planned for, and soon we were filling our water bottles with snow. The west face looked a bit dreary from our vantage beneath it. It looked like a giant scree slog. Phil noticed a shallow gully with water seeping over it and decided this was likely the most scree-free zone, so we headed up towards it. 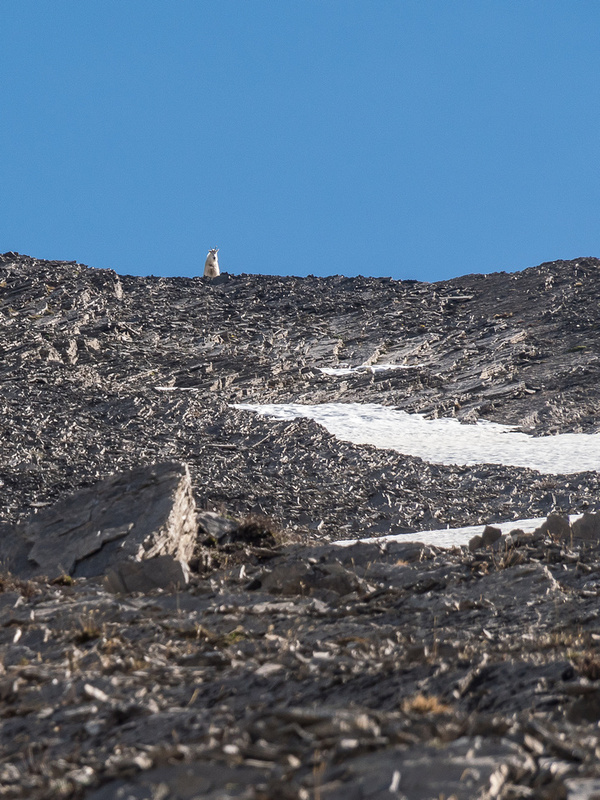 On our way up the lower face I happened to spot a Mountain Goat high above on the south ridge, gazing down at us curiously. It even wandered closer for a bit before disappearing. Once again we got lucky with our route. 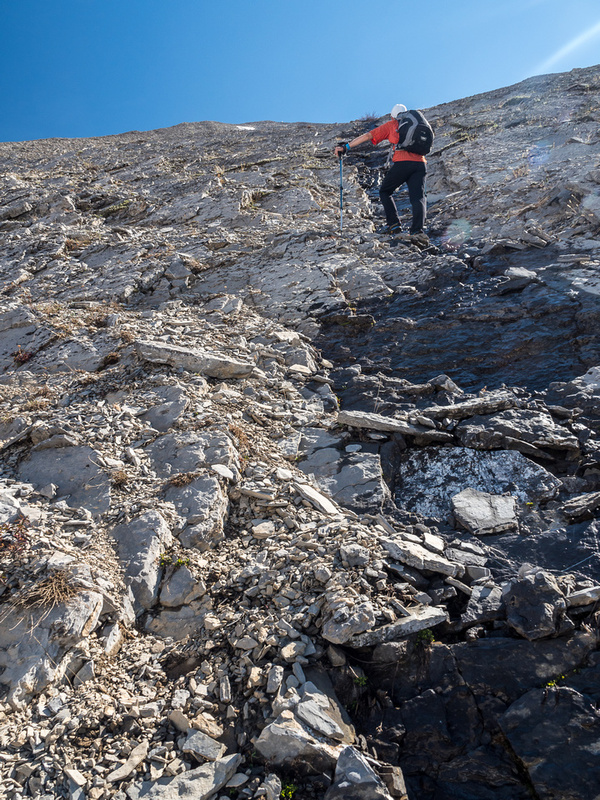 The gully had shallow slabs in it and we quickly ascended them to about 100 vertical meters from the south ridge before the scree turned a bit ugly. Our views were absolutely stunning as we crested the south ridge and took in the myriad of peaks, valleys, streams, lakes and tarns all around. 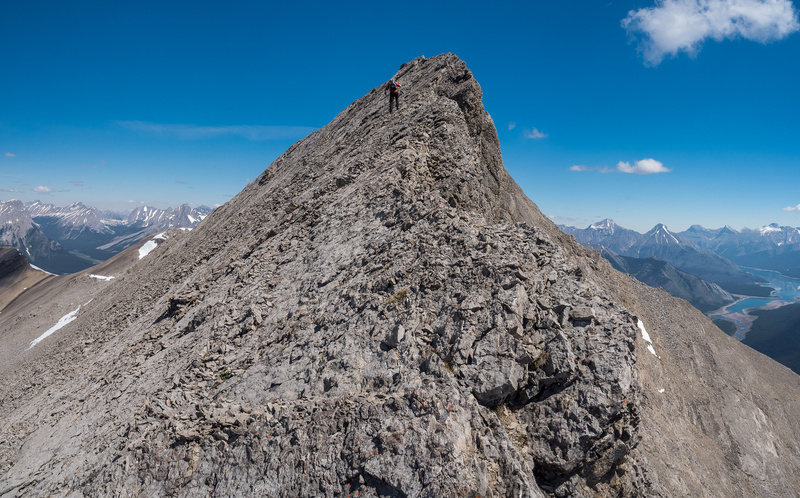 We wandered to the end of the south ridge to take even more photos before turning our attention back north towards the summit – looking a bit intimidating along the exposed south ridge. The camera is going to be overheating for the next few hours! From L to R is Currie, Red Man, Byng, Assiniboine and Magog. Holy crap! That’s a view! Phil wanders south to the end of the south ridge. Views south off the south ridge with our approach visible at bottom left. 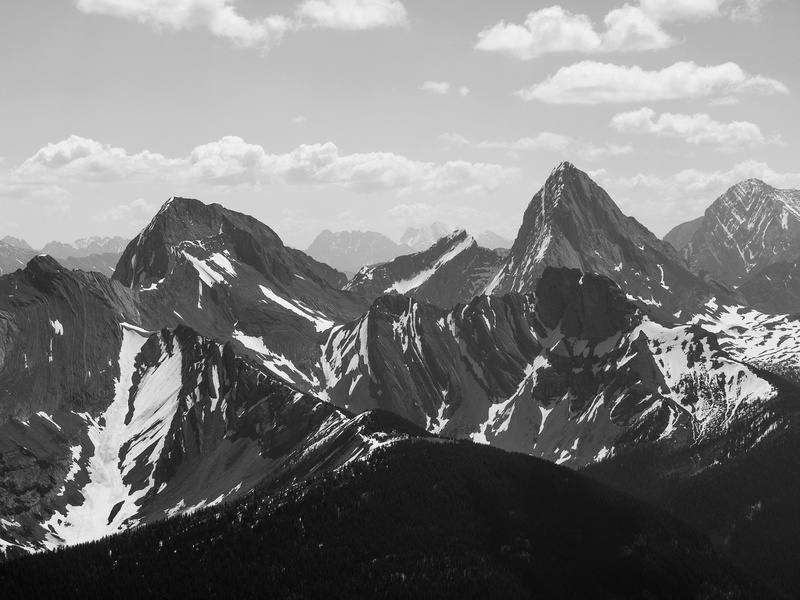 Prominent peaks include (L to R), Shark, Smuts, Birdwood, Smutwood, Sir Douglas, Warre, White Man, Currie and Red Man Mountain. The first part of the south ridge was pretty easy. 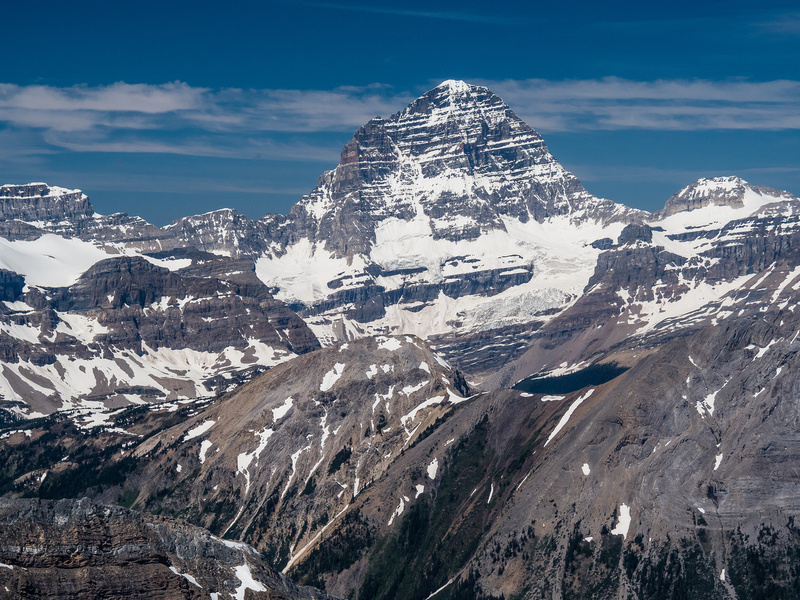 We had spectacular views toward the Spray Lakes on our right and over Mount Byng with its tarn and towards Mount Assiniboine on our left. The best part was that we had no wind and puffy white clouds to keep us cool every once in a while when the sun hid behind them. 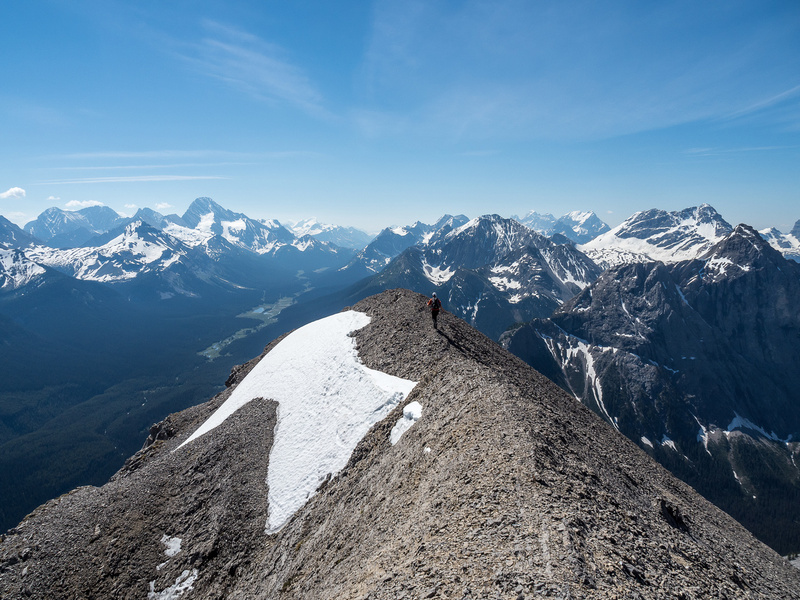 As we circumvented the first obstacle on the ridge, we realized that Mount Morrison might not be the “pushover” we’d expected. 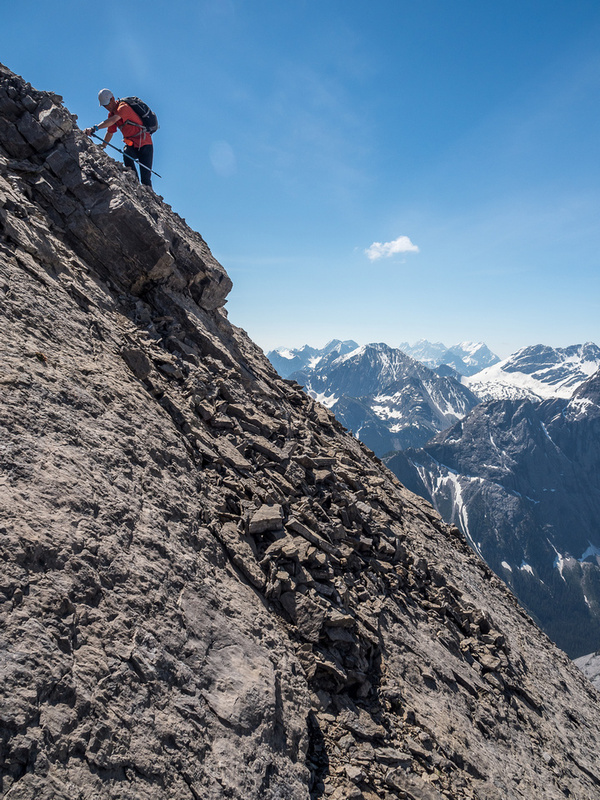 Despite the summit being close, it took longer than expected to scramble up moderate slabs and along very exposed and narrow bits of the south ridge. In general it was best to stick with the ridge crest, as the slabs on our left were covered in scree and much steeper than they appeared. 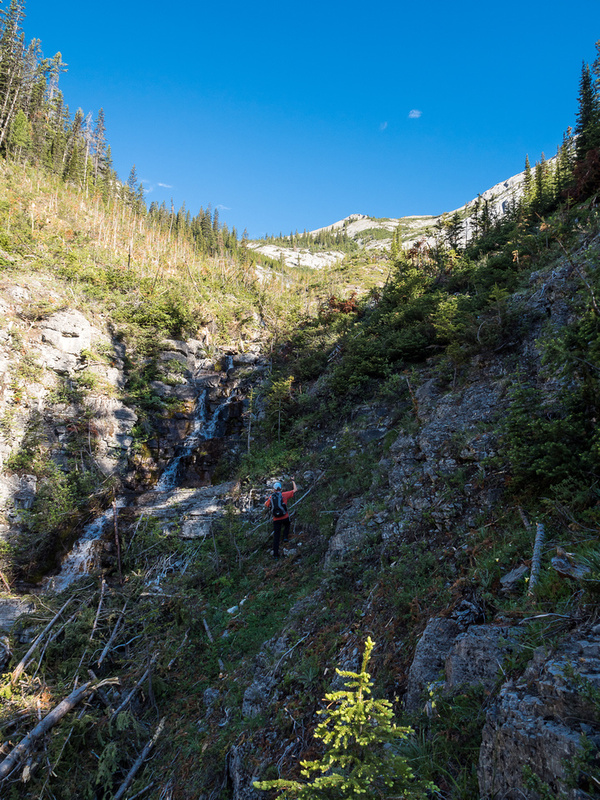 I can’t say any of the terrain was truly difficult, but it was enough to keep us wary and attentive – the exposure to our right was awesome in spots. Eventually the summit was in sight and soon we were on it with stunning views in every direction and perfect weather conditions. To our delight, when we exposed the summit register we were only the 6th party in 31 years since Collier in 1987 to stand on this prominent and well-situated peak. I love it when I stand on peaks that have decades between ascents rather than only days or weeks! Some moderate (exposed) slab scrambling on the south ridge. Now there’s a panoramic view! 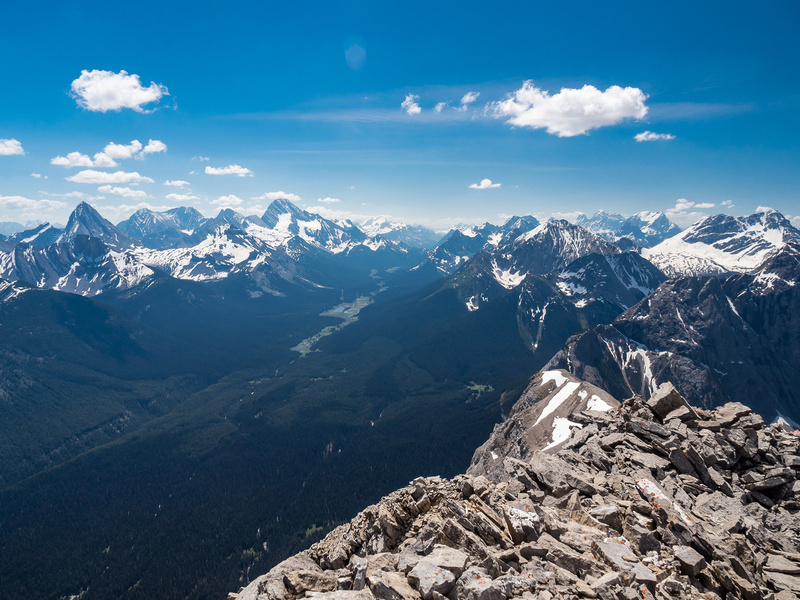 Looking north (L), east (C) and south (R) off Morrison’s summit includes peaks such as (L to R), Turner, Cone, Old Goat, Nestor, Lougheed, Sparrowhawk, Buller, Bogart, Engadine, Tower, Galatea, Chester, Shark, Smuts, Birdwood, Smutwood, Snow Peak and Sir Douglas among many, many others. Gazing far to the south over the lovely Spray River Valley towards Height of the Rockies Provincial Park. Mount Sir Douglas and Joffre visible at left. Mount Warre and Craddock rise to the right of the valley. 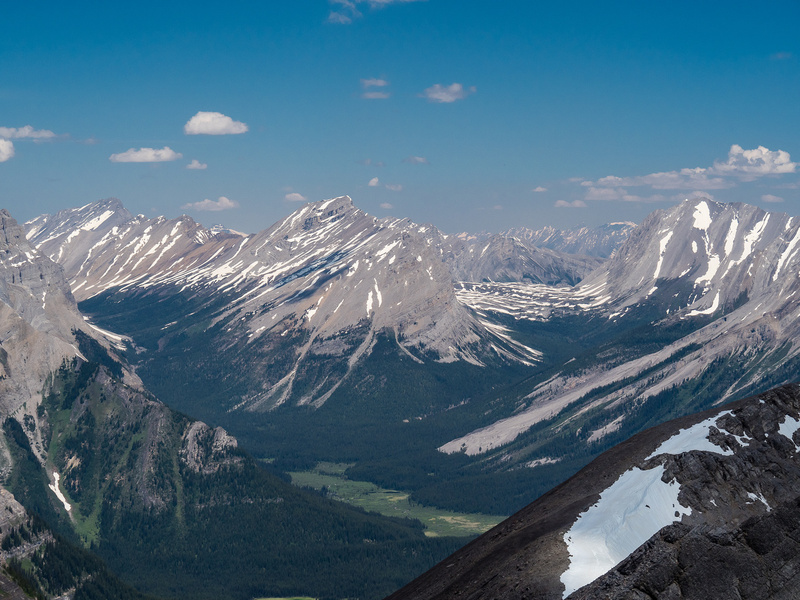 A panorama over Watridge and Spray Lakes includes from L to R, Fortune, Old Goat, Nestor, Lougheed, Sparrowhawk, Buller, Bogart, Engadine and Tower. 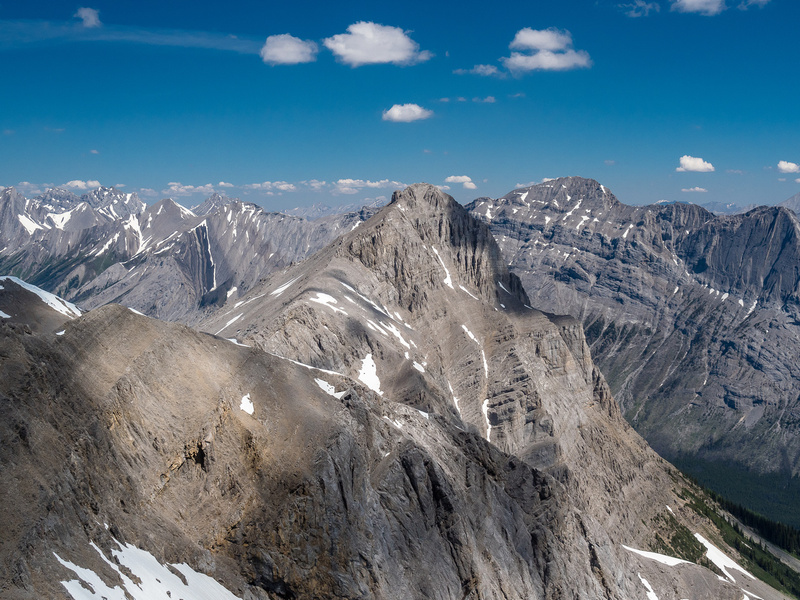 After a nice 30 minute break and way too many photos of familiar and unfamiliar summits from Kananaskis to Assiniboine to Height of the Rockies, we turned our attention to the remainder of our day. 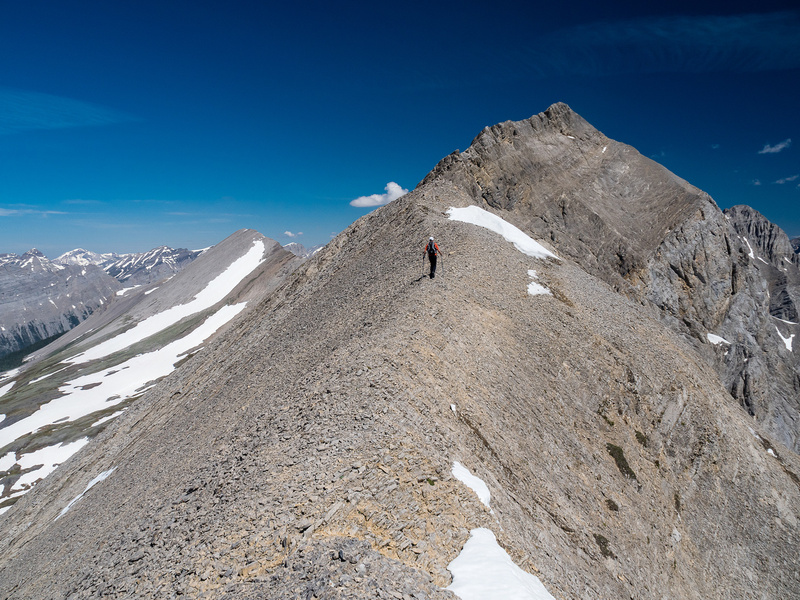 We were now 5 hours into it and Owl Peak looked like quite a long ways off with some potentially interesting scrambling bits to get onto it’s summit ridge. An early morning bike ride through the Shark area with our mountain looming far off in the distance. Early morning along the Spray River Trail. Mount Morrison looms high above our approach valley. It's always a good sign when each subsequent trail gets less and less traveled on my trips. This is exactly what we like. A neighbor of the forest warily watches us tramp on by. The Currie Creek Trail is really old. 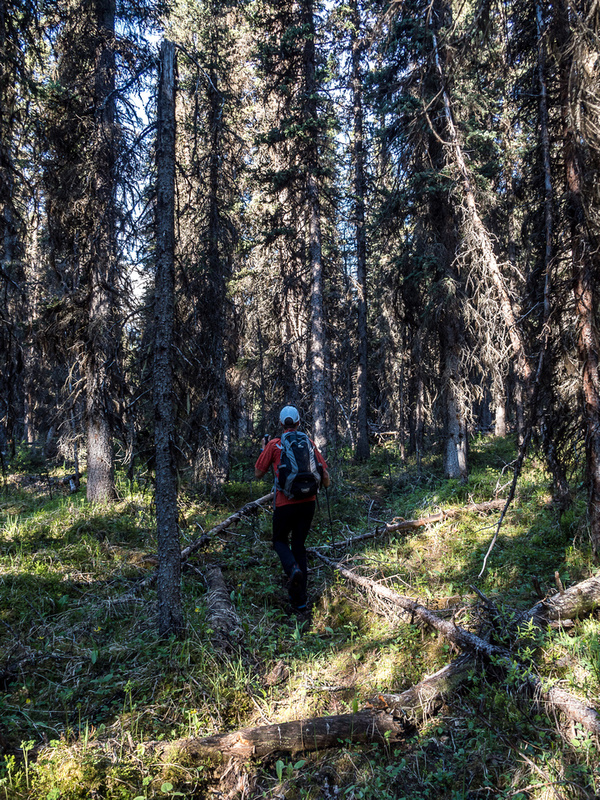 The Currie Creek "trail" goes through valley bottom and crosses quite a few marshy bogs. This is looking towards Morrison as we round its south ridge. 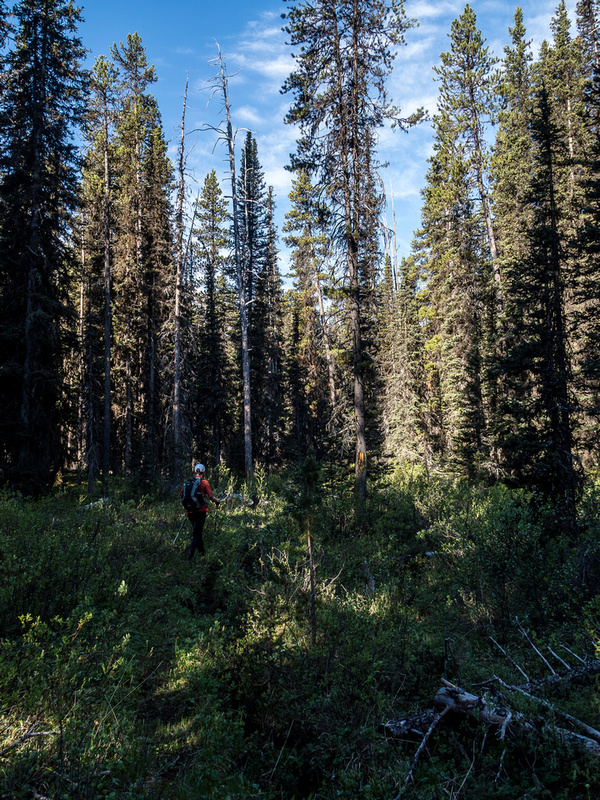 I love Alberta "bushwhacking". So pleasant - especially when compared to BC's hellish undergrowth! Looking south towards the very impressive Mount Currie and down our avalanche gully. Hard avy debris in the ascent gully. [Ascending some slabs with the south / west aspect of Morrison visible above. We passed through a surprisingly dense little grove of trees. Lovely alpine hiking with our ascent slope rising above. 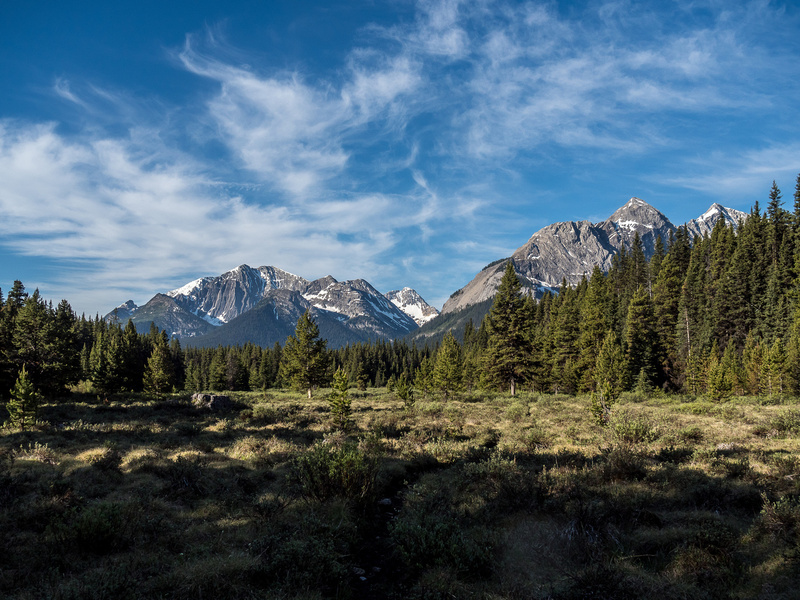 The sublime alpine meadows between Byng (L), Owl (C) and Morrison (R). Up close the slab is visible and very welcome. A mama goat looks down on us from the south ridge. Looking towards Owl Peak's false summit from our ascent slope. Some parts of the west slope were more of a grind than others. Holy crap! That's a view! Phil wanders south to the end of the south ridge. Views off the south ridge as we head for the summit aren't too shabby! Spray Lakes and Watridge Lake at center. The first part of the south ridge is easy. 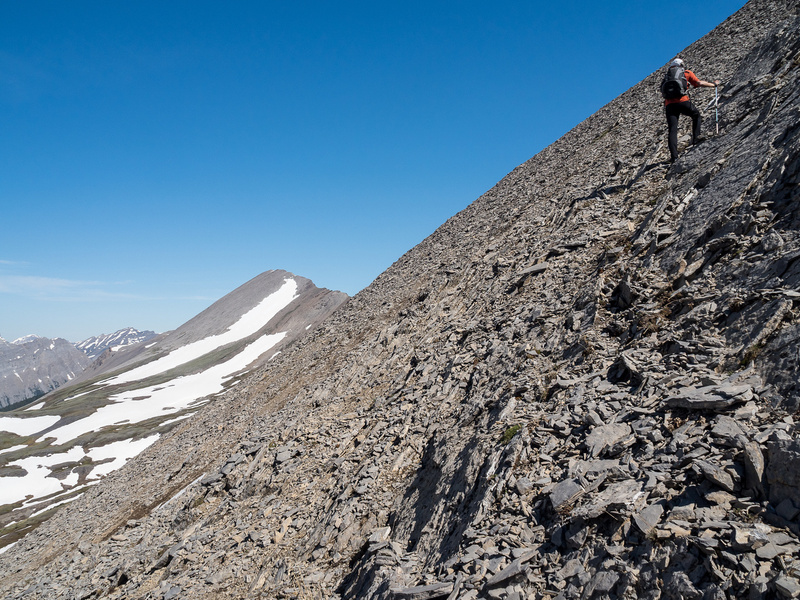 As soon as we deviated off the ridge crest we'd encounter steep slabs with scree which quickly sent us scurrying back up the ridge. Looking back down the south ridge along its east face. More easy scrambling terrain on the ridge. Back on moderate terrain with obvious exposure. 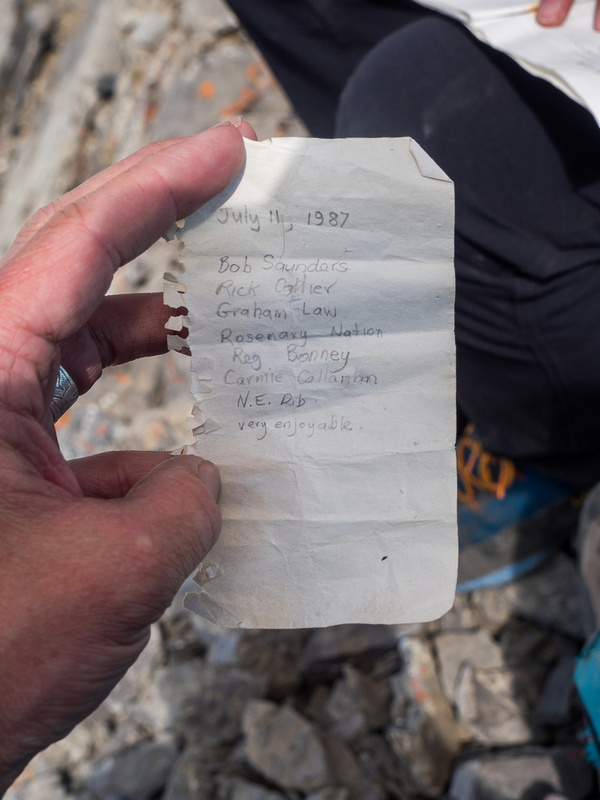 An old summit register on Morrison. Looking north (L), east (C) and south (R) off Morrison's summit. The Royal Group includes (L to R), Prince Albert, King George, Prince Edward, Prince Henry, Prince John and Queen Mary. 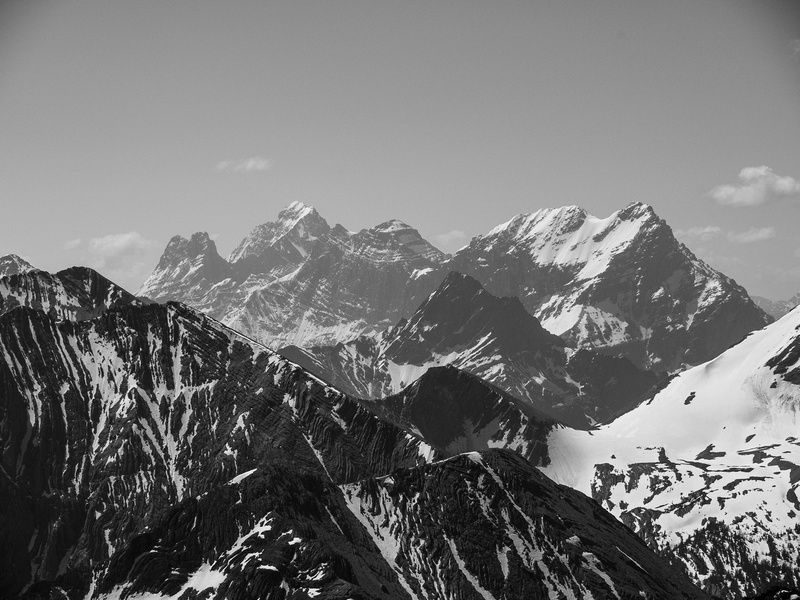 White Man Mountain looms over an outlier of Mount Currie. 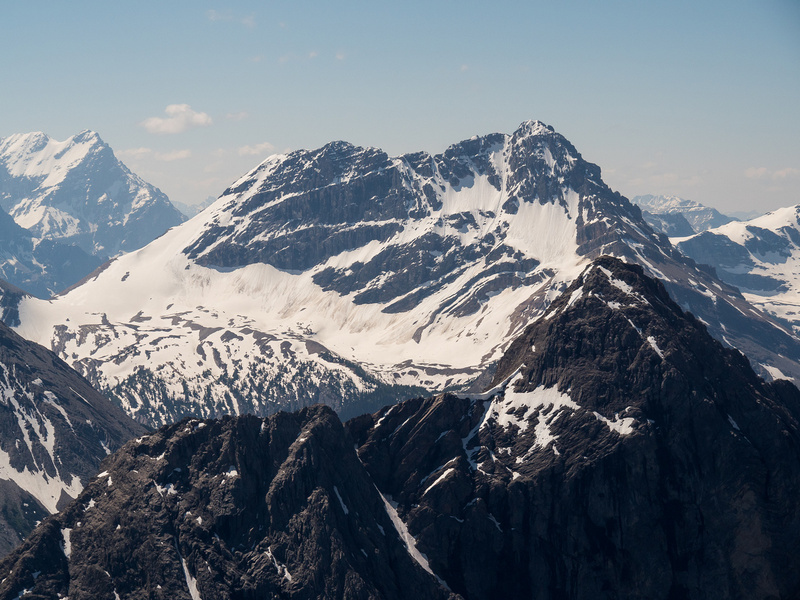 Mount Currie at left foreground with Red Man Mountain at right. Views towards Assiniboine Park include (L to R), Eon, Aye, Assiniboine, Magog and Marvel among others. 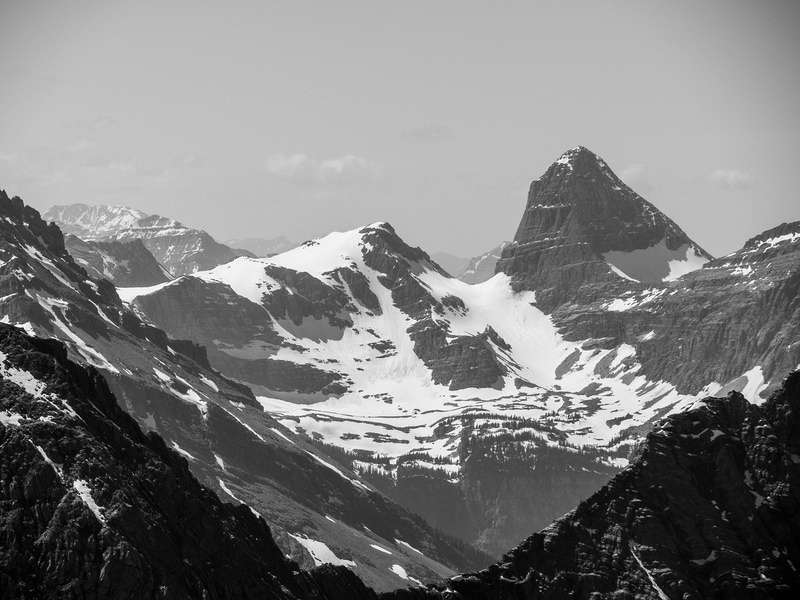 I'm proud of standing on top of Assiniboine - one of my all time favorite days in the mountains. The Towers at left with Nestor Peak rising to the right in the background. 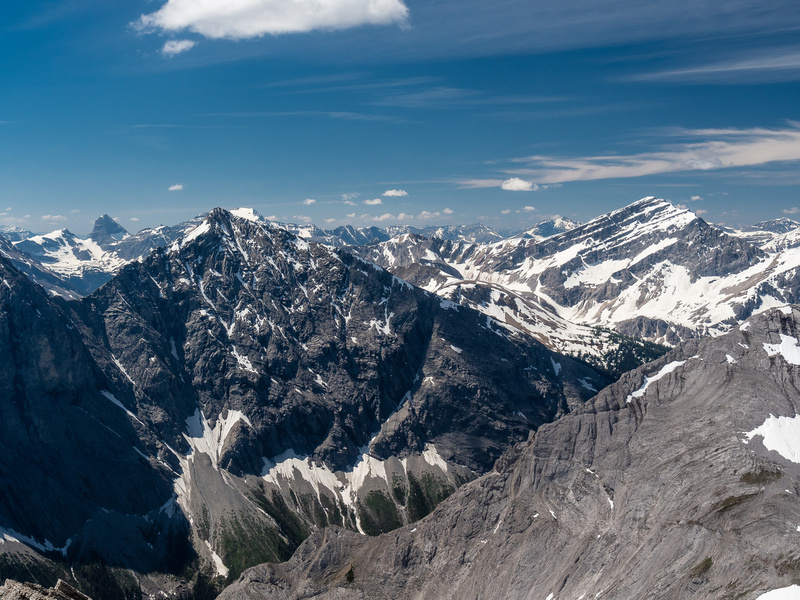 Looking past Cave Mountain and Mount Cautley on the left, up Assiniboine Pass with Og Mountain and Naswald in the distance. 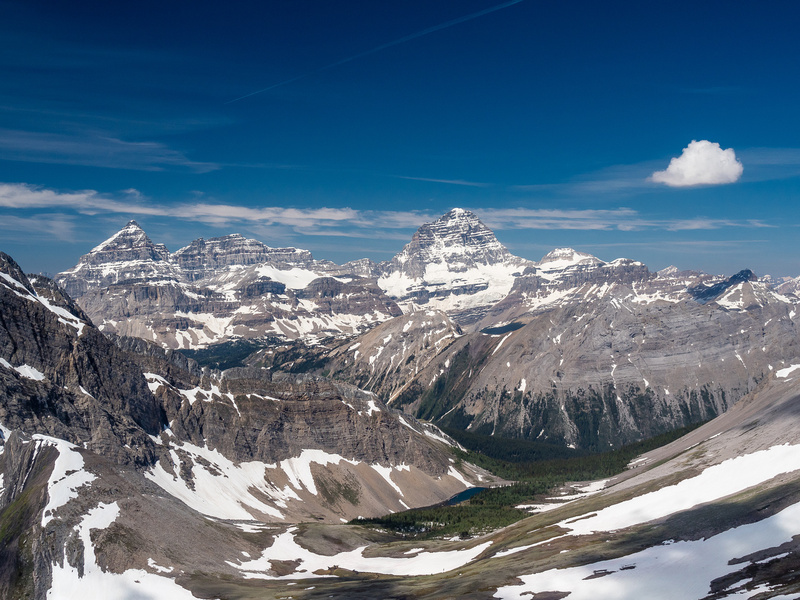 A wider shot toward Mount Mercer and Allenby showing Allenby Pass at right and Assiniboine Pass at left. 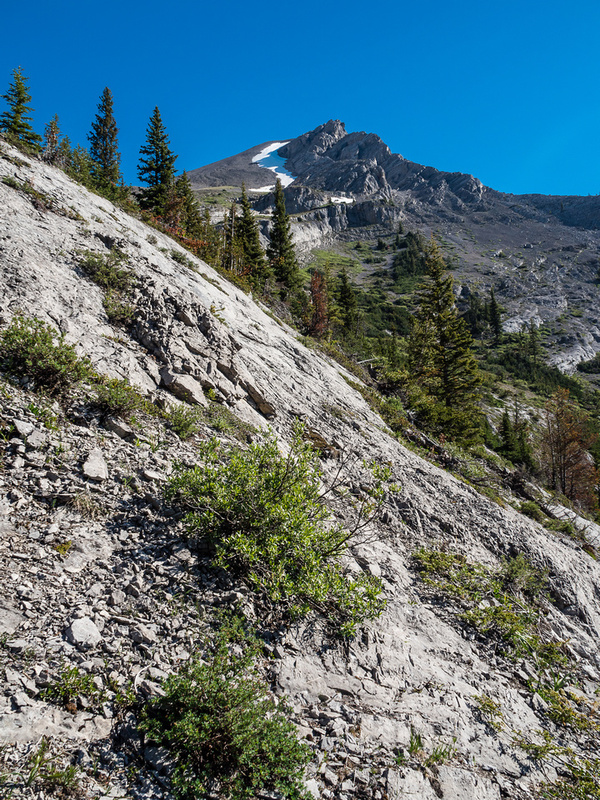 Views along the steep east face of Mount Turner. 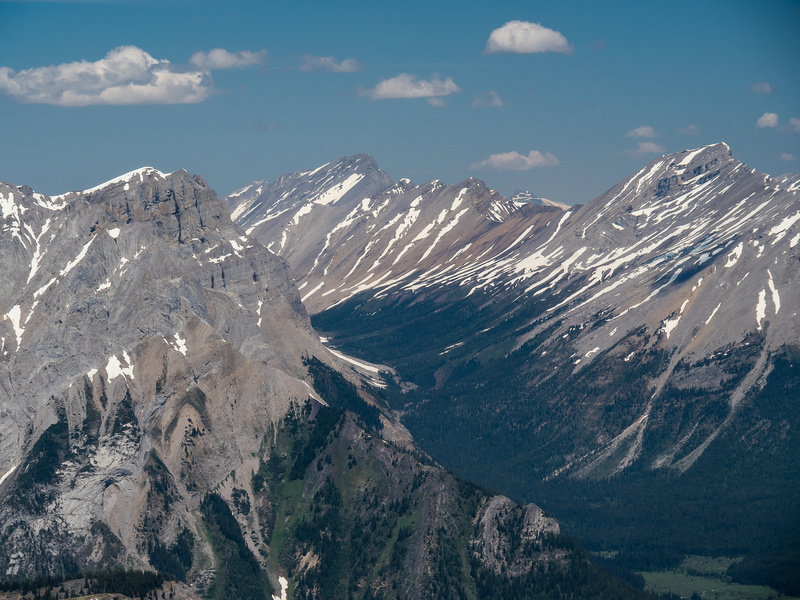 A west facing panorama includes Warre, White Man, Currie, Red Man, Byng, Eon, Aye, Assiniboine, Magog and Owl Peak (L to R). The exposure off the summit is fantastic! The colors of the lakes is stunning, as is the clarity of the many peaks lining the Spray Valley. 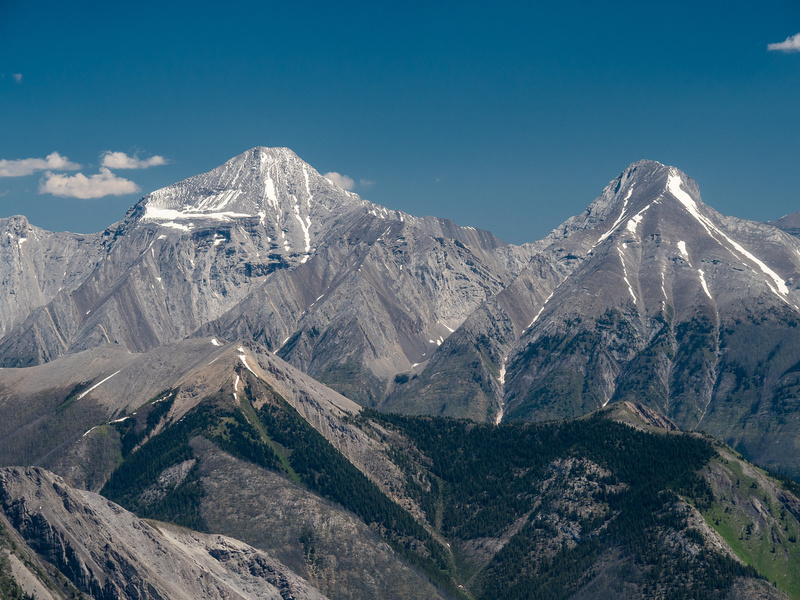 Old Goat and Mount Nestor rise high above tiny Mount Fortune. Mount Bogart rises over Mount Buller. 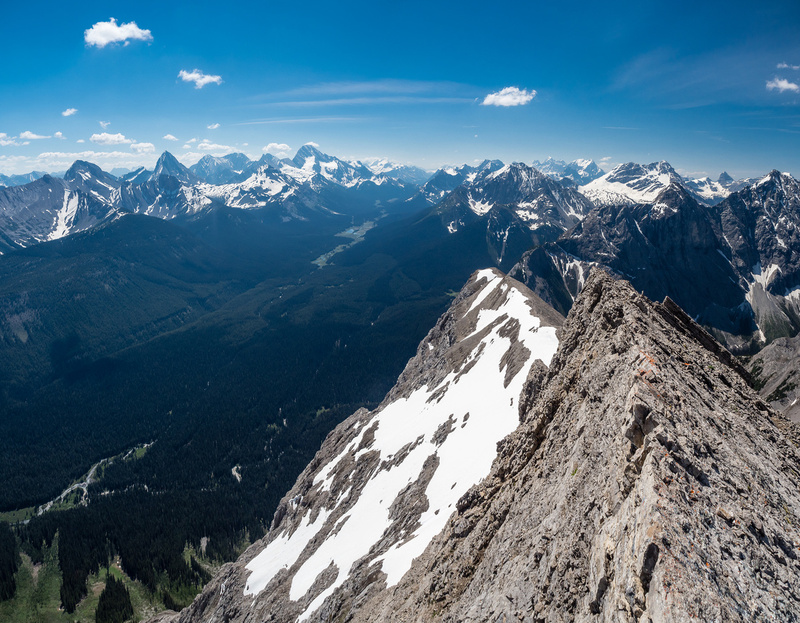 One more panorama over Watridge and Spray Lakes includes from L to R, Fortune, Old Goat, Nestor, Lougheed, Sparrowhawk, Buller, Bogart, Engadine and Tower.